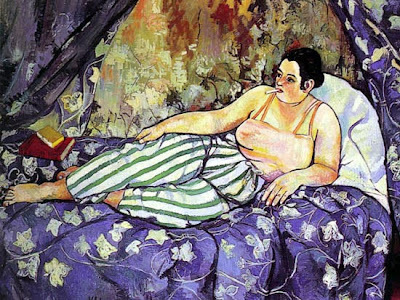 Recently Jelena from The Sundance Channel sent me a link to a Mother's Day post about Suzanne Valadon (1865-1938), an artists model and painter during Le Belle Epoque France. Suzanne not only was the first woman admitted to the Societe Nationale des Beaux-Arts, she is also the mother of the painter Maurice Utrillo. The daughter of a laundress, born Marie-Clementine Valadon, Suzanne first became a circus artist at the age of fifteen, until a fall from the trapeze a year later ended her circus career. Instead, Suzanne moved to Montmartre, the center of the bohemian art world in Paris at the time, to pursue her interest in art. She worked first as an artists model, working with Toulouse-Lautrec, who gave her painting lessons in exchange. She had an affair with Renoir, and became good friends with Edgar Degas, among others. Degas encouraged her art and bought drawings and paintings from her as she pursued her career. I love the artist "groupies" from Modern art. They're smart and vivacious and new how to live life while other women were bound by tradition. I will always strive to be a Gala Dali! I'm sure Suzanne would be a great person to exchange stories with at the bar. It's interesting, reading about Suzanne and Mary Cassat have made me interested in writing something fiction-wise set in this time period. Also Sunday in the Park with George, although I don't like the musical.